Data Sufficiency in Coordinate Geometry. Here is an interesting question on intercepts and points of intersection of two perpendicular lines. Line L is perpendicular to line K whose equation is 3y = 4x + 12; Lines L and K intersect at (p, q). Is p + q > 0? Correct Answer : Choice A. Statement 1 alone is sufficient to answer the question; statement 2 is not sufficient. Equation of line K is 3y = 4x + 12. It is a positive sloping line intercepting the x axis at (-3, 0) and the y axis at (0, 4). Line L is perpendicular to line K. The coordinates of the point of intersection of lines L and K are (p, q). If (p, q) is in the first quadrant, then p + q > 0. If (p, q) is in the third quadrant, then p + q < 0. Else we will need specific inputs about the point of intersection to determine if p + q is positive. However, as per statement 1, the x intercept of line L is less than that of line K.
So, the dotted line represents line L. If the x intercept of line L is less than that of line K, the point of intersection of the two lines will be further to the left. It is quite evident from the diagram that the two lines will therefore intersect in the 3rd quadrant. Any point in the 3rd quadrant will have negative x and y values. Therefore, p + q < 0. In the above diagram two variants for line L are presented. 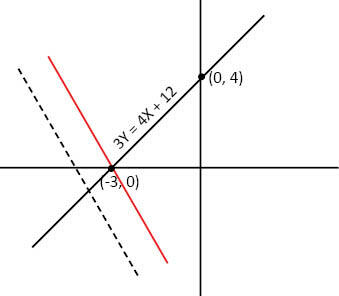 Option 1: In the variant where line L is in red, the y intercept of L is less than that of line K at (0, a). It can be seen that the point of intersection of line L (red) and line K (black line) is in the second quadrant. 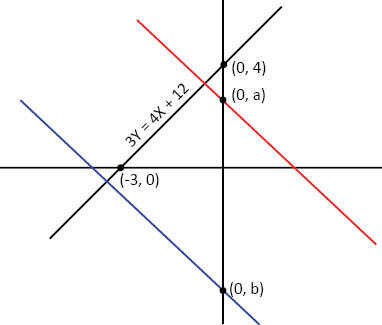 In the 2nd quadrant x coordinate is negative and y coordinate is positive. Therefore, p + q could be positive or negative or 0. Cannot determine. Option 2: In the variant where line L is represented in blue, the y intercept of L is less than that of line K at (0, b). It can be seen that the point of intersection of line L (blue) and line K (black) is in the 3rd quadrant. Here p + q < 0. As we are not sure from statement 2 which of the options line L could be, we cannot get a definite answer to the question.